California summer is here! If the past week is anything to go by then it is going to be a scorcher. Which means it is time for me to find summer vegetarian recipes which will satisfy my taste buds and my hunger without heating up the house. As a child, my mother introduced me to the joy of tomato sandwiches. 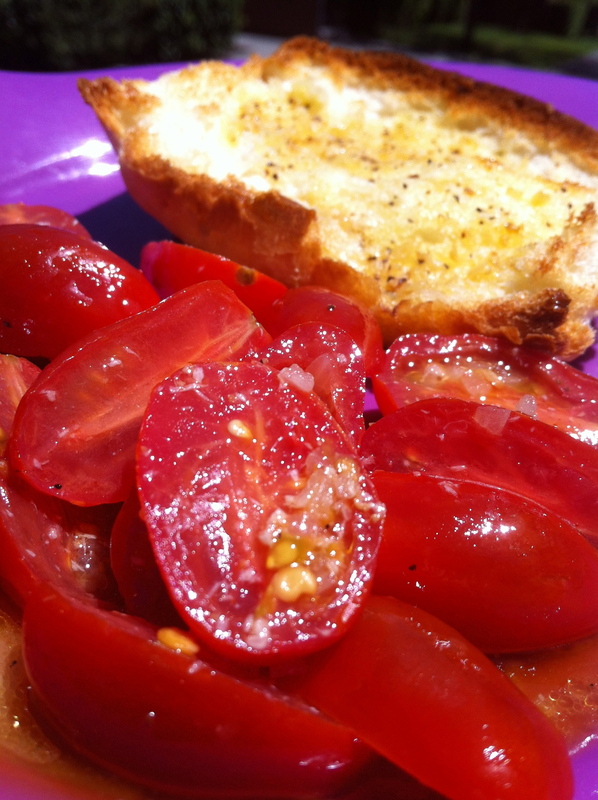 The most basic of ingredients; juicy tomatoes, toasted white bread, mayo and salt and pepper was all that was needed to make one of the most satisfying summer dishes. 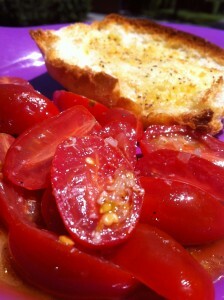 Ever since then, I equate tomatoes when no-cook summer recipes. On a particularly hot afternoon last week, I decided to see what I could come up with some tomatoes and bits of stuff I had in the fridge. The result was this bloody Mary tomato salad. After some time chilling out in the fridge, it really hit the spot. Served with some good bread to soak up the juices, it made for a perfect summer lunch. Not only did my taste buds tingle from all that was going on but I felt like I had just put something healthy into my body at the same time. For me, that is a winning meal. 1. Whisk the oil and vodka together in bowl until combined. 2. Stir in horseradish, minced onion, salt, pepper and hot sauce. 3. Add sliced tomatoes into the bowl and gently stir through to coat tomatoes. 4. Refrigerate for 30 minutes or more.